FOX Sports Arizona is taking over the Phoenix Coyotes ticket office again! 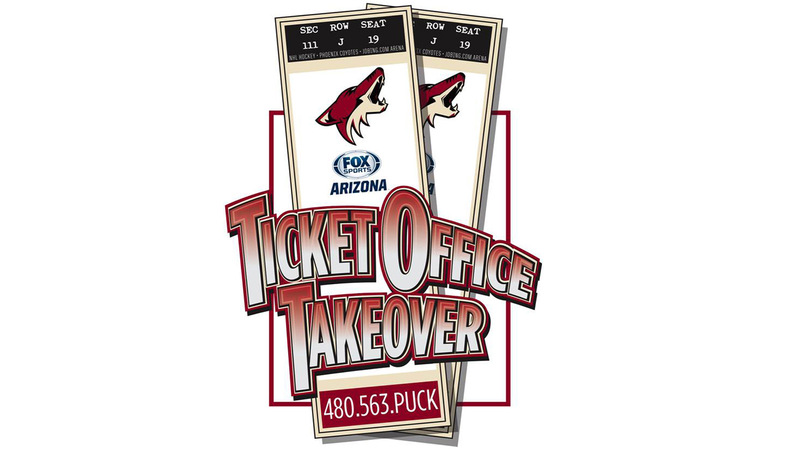 The third Ticket Office Takeover of the 2013-14 Coyotes season will run throughout Tuesday’s telecast on FOX Sports Arizona when the Coyotes host the Los Angeles Kings. The special ticket offer — and other unique Coyotes experience offers — will be revealed at the beginning of the "Coyotes Live" pregame show, which starts at 6:30 p.m., and will be available until the end of the "Coyotes Live" postgame show. Fans must call the Coyotes ticket office phone lines at (480) 563-PUCK (7825) during the telecast in order to participate and purchase tickets under the special offer. Once the postgame show ends, so will this one-night-only offer! FOX Sports Arizona televises the most regional sports action in the state and is the exclusive local cable television home of the Coyotes Diamondbacks, Suns, Cardinals, Mercury, Northern Arizona University and AIA championship events. FOX Sports Arizona is currently seen in 2.5 million households in Arizona and New Mexico and can also be seen across the country via home satellite services. For even more coverage of the local sports scene, log on to www.FOXSportsArizona.com, www.twitter.com/foxsportsaz and www.facebook.com/foxsportsarizona.